HTML processing to help you get a little more out of the Internet. Perfect for cleaning HTML generated by rich editors (such as Word), before being published to SharePoint, on a Content Management System (CMS), or Blog. 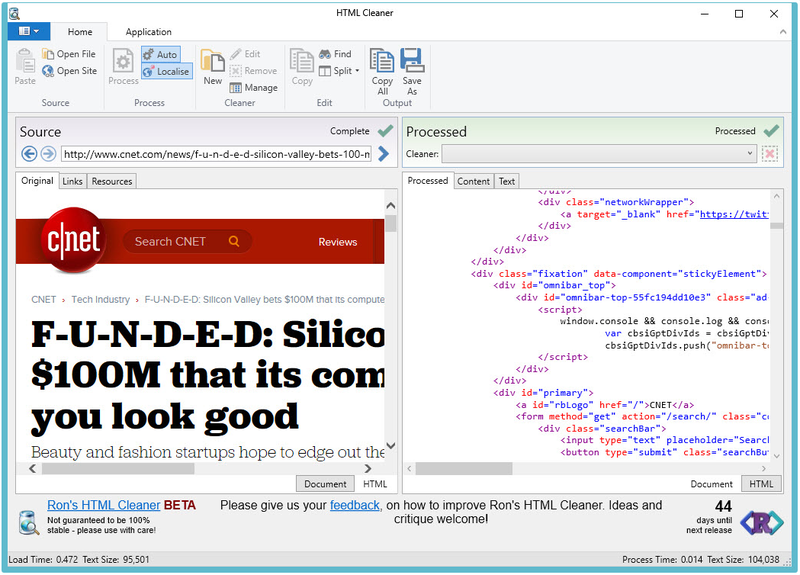 The HTML Cleaner contains the ability to clean, or alter, a source HTML document or page, through the use of Cleaners. Cleaners are made up of a list of operations that can be build, saved and applied to an HTML document as required. Any number of rules can be combined in any order to satisfy almost all Cleaning needs. Complex rule sets can be saved to give instant access to frequently used Cleaning tasks. With two or three clicks HTML can be Cleaned: select a Cleaner, click Paste, click Copy All. Job done! Lays out the HTML to enhance the visibility of the structure, and list links and images separately. Processes the source HTML in the blink of an eye to give instant visual feedback of the document before and after Cleaning. Ideal for taking an HTML page written in a rich text editor like Word, and cleaning it before publishing a Blog or CMS to remove redundant code and formatting. By way of an example many people compose content intended for SharePoint using Word. However they struggle when the formatting in the published document clashes with that on their SharePoint intranet site. Ron's Cleaner can strip the document of redundant formatting and code so that SharePoint can display the document using the corporate styling in use on that site. This applies equally to any Blog or CMS. Link and Resource Extraction View lists of links and resources from a web page. Clean and Format a WEB Page Build Cleaners from a list of rules, and view the formated output. 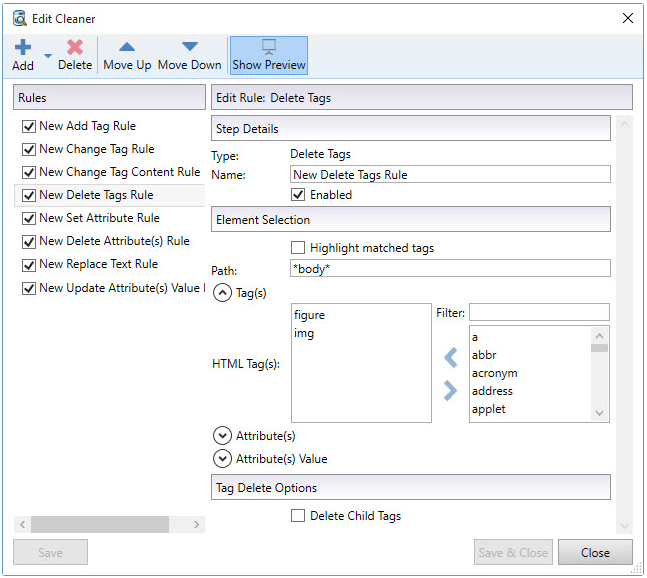 Combine any number of rules in a Cleaner Any number of rules can be combined into Cleaners and saved allowing total flexibility and fast operation. Save Cleaners Saved Cleaners are listed above the processed page for quick retrieval. Live preview Instant preview of the page after being cleaned by a Cleaner. Content Extraction Show the content (text and pictures) of a web page with no 'distraction'. 947 3,182 Aaron Stewart <img src="http://www.oldergeeks.com/downloads/gallery/thumbs/RonsHTMLCleaner1_th.png"border="0"> Jun 07, 2018 - 11:45 2018.06.05.1428 1.51MB EXE , out of 10 Votes.